Architecture - Stand and Deliver! I was flattered to discover on my Flickr page, a request that a photo I took (with either my phone or a none-to-flash digital unit I’ve had for about five years) be added to an online ‘Flickr Group Pool’ called Modern Times: Modernism in Australia. Chuffed, how could I refuse? 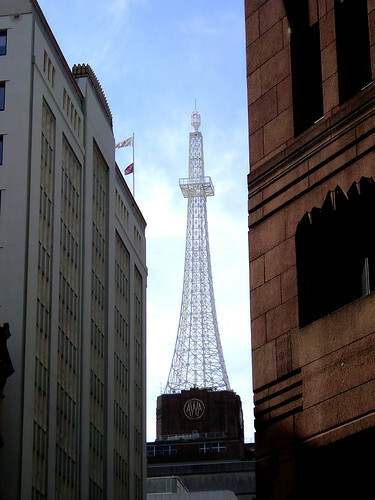 It's this image of the AWA Tower on York St in Sydney’s CBD, seen, I think, looking back from further south along York St.
I’m not sure when I first became aware of the AWA Tower, although it would have been after stepping off a bus at Wynyard – something I only started doing as a way of life in 1990, when I started going to university in the city. Until then, trips to the city were few and far between, and – apart from trips in with school friends to visit all our favourite secondhand and import record stores one day during each set of school holidays – would have mostly been made by car, avoiding that part of the city altogether. The infatuation with this tower atop its art deco building, emblazoned with the AWA logo, relates back to a childhood memory of the same logo on the side of a big box, in our garage. The box must have once held a television, though not ours. The first one I remember us owning was a black HMV model, the letters standing for ‘His Master's Voice’, with the standard logo of ‘Nipper the Dog’ paying attention to a gramophone horn from which a high fidelity reproduction of that sound must have been emanating. That was eventually replaced, in the late 80s, with a colour Rank Arena model. So how the box came to be in our garage is anybody’s guess. Under the logo were the words Amalgamated Wireless (Australasia), which itself seemed interesting and mysterious. I’d never heard of, and so had no concept of, amalgamation or Australasia. I do also remember a couple of television advertising campaigns that I linked back to that box: AWA/Deep Image ads for television sets, with a jangly pop jingle of some kind. Later on there was an ad for the utter chaos society would descend into if all the AWA devices suddenly disappeared. I can’t remember what they all were apart from perhaps radar devices, in whose absence, a ship got lost, and utter gridlock as all the traffic lights malfunctioned. The same result would ensue in this part of the city if all drivers were as inexplicably infatuated with the AWA Tower as I am. I certainly think of it whenever there is a reference in the press or online of Australian Workplace Agreements, as they’re always followed, in parentheses, by the phrase’s initials: ‘(AWA)’.